Stinking hellebore, setterwort, dungwort, foetid hellebore, ox heel, stinkwort, barfoot, bearfoot and bear's foot. 60cm height by 50cm spread. Forms clumps of foliage from which flowers grow on short stems. Late winter to early spring. Prefers chalk, clay or loam soil which has an alkaline or neutral pH. A sheltered position is best to prevent the leaves becoming tattered. Downward facing, pale green flowers (sometimes with purple edging on the petals) extend on reddened stems above the darker green, palmately divided foliage. The foliage gives off an unpleasant smell when crushed. Excellent in woodland settings or beds/borders with dappled shade. Works well in both cottage style and more urban gardens. Useful for underplanting roses and other shrubs, to provide year round colour. 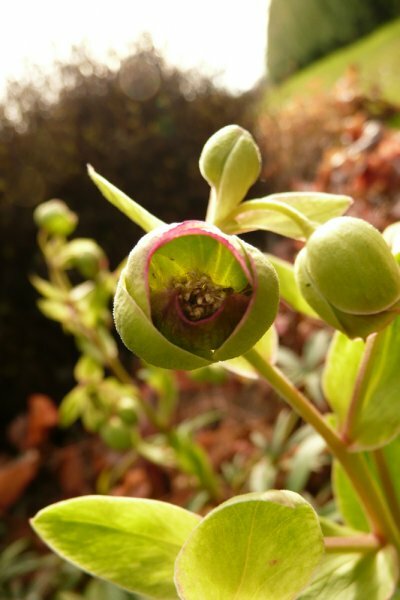 Hellebores require little maintenance, except for cutting back tattered leaves (see below). Prune out faded or browned foliage from the base throughout the year. Many people like to remove the foliage shortly before flowering so that the delicate flowers aren’t hidden. Can be divided when the plant is mature and should flower the following year. Younger clumps can be pulled apart but more established plants may need back to back forks or a knife to divide them. Division should be carried out in autumn or very early in spring. 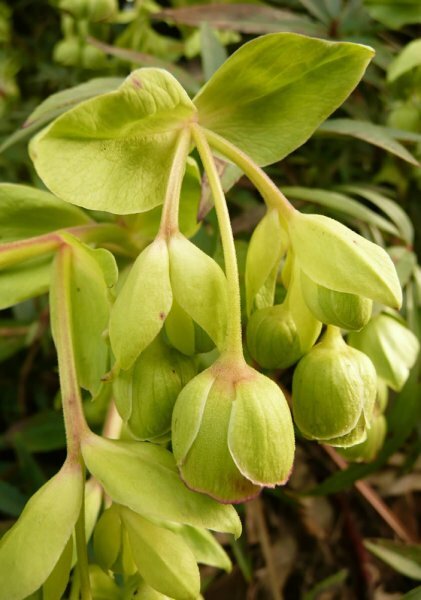 Hellebores generally self-seed freely and the seedlings can be carefully lifted from underneath the plant and transplanted in spring when they have at least one true leaf. Alternatively, seeds can be collected from the ripe capsules (they are ripe when they ‘burst’ open when gently squeezed) in the spring/summer. The seeds should be sown when fresh (or stored in moist horticultural sand) and kept outside in the cold to overcome their dormancy. They should germinate the following autumn or spring. Flowers and leaves can become infested by aphids and the leaves by hellebore leaf miner. Leaves can suffer from downy mildew and Helleborus leaf spot. 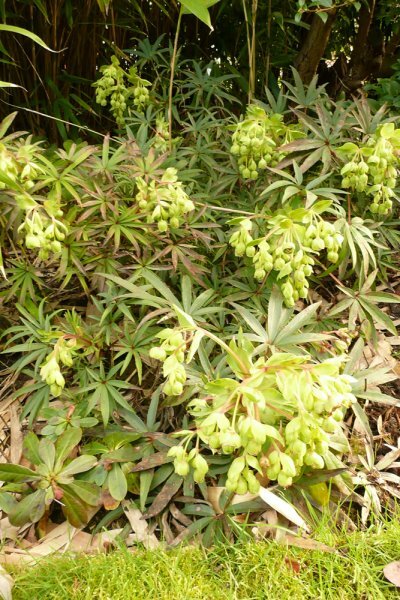 May be affected by the (probably) viral hellebore black death disease, although this is most prevalent among Helleborus orientalis plants. The name ‘helleborus’ probably derives from the Greek for ‘food eaten by fawns’, although others consider it to come from the Greek for ‘killing food’ due to the poisonous nature of the plant. Hellebores have been, and in some cases still are, used for various medicinal purposes including cardiovascular operations, toothache and gout. However, many hellebores are highly toxic – the Greeks reportedly used hellebores to poison the water supply of a besieged city. 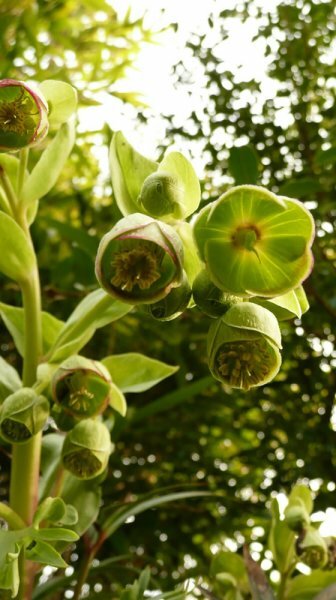 Helleborus foetidus has been given the Award of Garden Merit by the RHS. It is named ‘foetidus’ due to the unpleasant smell which its leaves emit when crushed, which is said to resemble to odour of rotting meat.